I change my mind all the time. Especially when it comes to my personal style. I've been searching for ways to swap and sell my clothes online and off for years. So, in an attempt to do so, I've experimented with a few of 'em. Swapdom is a cool idea. You post photos of items, the info, they have a set and expensive shipping, and you select other people's items you like, offer up some of yours, and wait and wait. Their system will eventually match you up in a multiple person swap. It's complicated and that's why it takes a long time. You have no idea which item might end up getting swapped and which you will get -- until they email you. This forces you to make very wise choices. I like that Vinted has a really easy to use interface and iPhone app. I like the way this entire website works, however, I have some quips about it. First, I came here to swap, but most people are here to turn a profit. Vinted takes a cut, so prices are a lot higher than they usually would be. The shipping is in three pre-set tiers (more than I generally am able to ship for). The quality of people interested in swapping is very low and when you do want to swap, it costs money. This was a huge turn off for me. Vinted makes you each set the price to the same, say $12, you each purchase the item for $12. Vinted takes their cut and charges you for shipping. You then receive less than $9. To me, swapping should be free + shipping. The people on Vinted are pretty intense and kind of pushy. Out of all the "deals" I made with people, only one was successful. A lot of back and fourth. Additional Info: This is an unregulated system that works on the honor system. This is probably my favorite for swapping. It's on your own terms, no fees, you arrange all swaps. Bartering isn't the most fun, but when it works out, it's amazing. The swapping is completely on your own, so you do have to trust people and hope they are honest (they almost always are). These groups are private and you will need to be invited to one. I love Storenvy for selling. They do not take a cut and it's perfect for cleaning out your closet. Storenvy also adds your items to their marketplace so that your items can reach a whole other level of shoppers. It's kind of like a less homemade version of Etsy. This totally depends on what is available where you live. I've tried Plato's Closet and they're the worst in my opinion. They only accept super trendy clothes and offer essentially pennies in return. I've had success purchasing clothes here in the past, but not much lately. Places like Avalon Exchange and Buffalo Exchange are way better in my opinion. They aren't as concerned with name brand, take vintage, and offer a significant amount of in-store credit as well as cash. Additional Info: On your own terms! My favorite way to get clothes swapped. My friends and I throw a Frock Party every season and we've even thrown a large scale one. 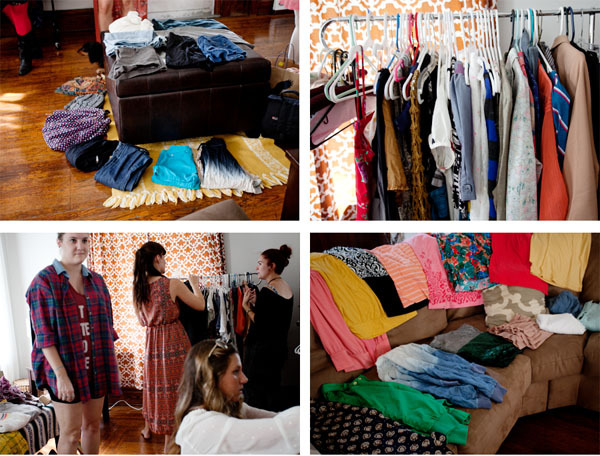 This is a great way to get together, have fun, and revamp your closet. Plus it's totally free! P.S. If you're in Akron/Cleveland we're throwing one of these next month! E-mail if you'd like more info! Hope this helps in your quests. Got a question about any of these websites? Let me know!